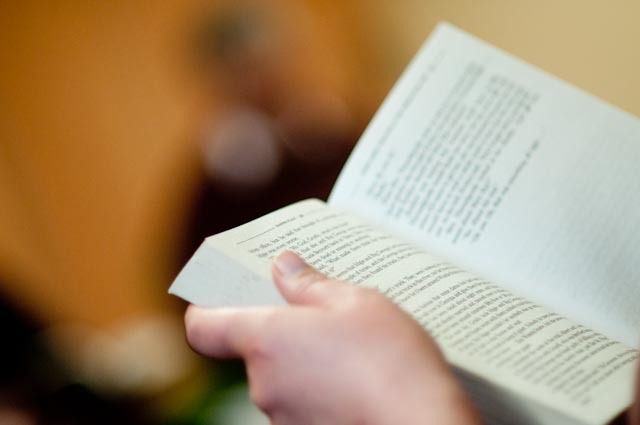 The Reader recently learnt that our Shared Reading group at Broadgreen Hospital in Liverpool has been recommissioned for the next five years – a great vote of confidence in its worth – but what is chronic pain and how does Shared Reading help? An article in The Times today describes how people with chronic pain, who were played images of themselves for two minutes via a head-mounted camera feed, found temporary relief through the illusion of ‘leaving their body behind’. Chronic pain is defined by the International Association for the Study of Pain as ‘an unpleasant sensory and emotional experience associated with actual or potential tissue damage, or described in terms of such damage’. It is a pain which persists for more than six months and ‘unpleasant’ is a huge understatement. What patients really have is suffering . Defining pain as an ‘emotional’ experience is crucial. Usually pain is picked up by specialised cells in the body and impulses are sent through the nervous system to the brain. What happens in people with chronic pain, however, is that other nerves are recruited into this ‘pain’ pathway which starts to fire off messages to the brain when there is no physical stimulus or damage. Pain is a complex feeling that affects thought, mood and behaviour and often leads to isolation, immobility and drug dependence. In that respect, chronic pain reassembles depression, and the relationship is intimate. Pain is depressing and depression causes and intensifies pain. People with chronic pain have three times the average risk of developing psychiatric symptoms and depressed patients have three times the risk of developing chronic pain. The reading group at Broadgreen Hospital has been the subject of two research projects conducted by CRILS (the Centre for Research into Reading, Literature and Society) at The University of Liverpool and findings have helped convince commissioners that Shared Reading is an intervention which can help people for whom pain is, as one group member put it, ‘a life sentence’. The first of CRILS’ reports found that the mental challenge of Shared Reading created a state consistent with the concept of ‘flow’, whereby people can relinquish awareness of their physical needs and bodily state, ‘becoming more fully themselves – more fulfilled and absorbed, more vitally alive – in forgetting the self, whilst engaged in meaningful activity’. Participants – regardless of previous reading experience – universally showed a preference for intellectually and emotionally demanding literary pieces which produced closer concentration and absorbed attention, reducing awareness of pain – ‘as though the extra mental effort helped shift immersion to another level and blocked out the pain more successfully’. The most recent of CRILS’ reports, published earlier this year, compared CBT (Cognitive Behavioural Therapy – a recognised intervention for chronic pain and depression) with Shared Reading. The report suggests that Shared Reading’s encouragement of greater confrontation and tolerance of emotional difficulty through engagement with literature makes it valuable as a longer term follow up or adjunct to CBT’s concentration on short term management of emotion. The spontaneous and independently constructed patterns of thinking sparked by Shared Reading at points of personal readiness make it an important complement to CBT’s expert-led ‘top down’ taught techniques of mind over matter. Group members range in age from 35 to 75 and experience a wide variety of conditions, including fibromyalgia and peripheral neuropathy, and with their initial experience of pain emanating from accidents, strokes, unsuccessful surgery or illnesses. ‘This is the closest thing I ever get to work’. Hi Anne, lovely to hear from you. At present patients are referred to this particular group by consultants at Broadgreen Hospital, however if you’re interested in joining this group we may be able to help. Can you contact us by emailing comms@thereader.org.uk? We can put you in touch with Kate who runs the group and will be able to help.